Our regular classes are dynamic, sought-after and a true expression of the passion of a quilter. Each class is specifically designed to showcase the individual teacher’s unique style and technique and offers the student an interactive workspace to grow their own style. We also hold social quilting groups where our visitors are able to share their projects and discuss varying design ideas. 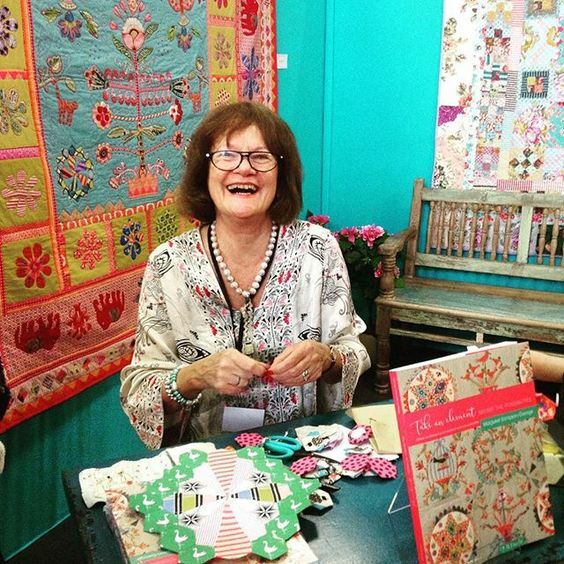 Marg George needs no introduction to the Cottage Quiltworks community. She uses traditional technique with her quilts yet goes beyond by adding a twist of quirkiness that gives her quilts a unique edge. Marg’s quilts have appeared in publications in Australia and overseas which highlights how incredible they are. Marg has a passionate following of quilters and the work that is produced in her classes is truly inspiring and an ode to the incredible nature Marg exhibits in her quilting and teaching styles. Lorena has a regular class on the 2nd Saturday each month. Sue is a popular teacher at CQW and is a multi award winning applique artist. A class with Sue is an opportunity to learn new techniques but to grow creatively. Brigitte Giblin is an Australian quilt designer and teacher who has been making quilts in the naive, antique and traditional styles for over thirty years. Considered one of Australia’s finest designers and teachers, Giblin brings a unique sense of style and an unconventional approach to quiltmaking. Her well considered designs are inspired by old quilts and reflect her love of fabrics, colour and geometric shapes, as she deftly applies old techniques to current fabrics. Recreating and capturing the look and feel of antique quilts, her quirky style continues to evolve in response to current fabric trends. She likes her quilts to be functional, her coverlets utilitarian. Born in the historical walled village of Aigues-Mortes, France and raised in Australia, Brigitte’s lifetime passion for fabric and design was ignited when, at age 18, she went to live in France for several years. She quickly embraced the culture of her parents, and her love of fabric was fostered by her aunt, who ran a successful dressmaking studio. The process of discovering old fabrics and quilts and exploring the flea markets quickly became a way of life. She returned to Sydney, where she married and balanced a career in Events Management with raising her three daughters. Like many quiltmakers, what began as a hobby in the mid-1970s has evolved into a lifetime passion for Brigitte. Starting out learning traditional patchwork techniques, it did not take long for her to graduate to the faster machine pieced quilts. She opened her own shop and quickly learned more about combining fabrics, then focused on designing and teaching patchwork. Now in demand as a teacher, Brigitte says she has “settled down, and I’m really enjoying playing with fabric and the hand piecing process.” Her designs are considered, and reflect her sense of colour and her innate ability to choose fabrics that work together. With her classes perpetually full, she virtually eats sleeps and breathes quilting and, inspired by old quilts is forever designing and planning new quilts. Many of her patterns have been published in Australian patchwork and quilting magazines. Annette is a wonderful asset at Cottage Quiltworks. She has invested time and effort to create classes that allow our students to test out differing areas of their quilting and sewing. Annette’s classes are a wonderful experience, we are incredibly lucky to have Annette’s expertise on hand in the classrooms and in the shop. Miriam is another one of our gifted teachers who shares her passion, knowledge and expertise in both the shop and the classroom. Miriam’s wonderful blog, Sew Miriam (http://sewmiriam.blogspot.com.au) showcases her beautiful designs and work that she shares with her students. Miriam will be teach a regular “Quilt Magic” class on the 3rd Saturday each month during 2019. For more information please contact the shop. Rachael is a quilt designer, teacher and fabric addict who loves Old Quilts, English Paper Piecing and Applique. We are thrilled to welcome Rachael to Cottage Quiltworks as a regular teacher for 2019. Rachel’s classes are the 2nd Monday each month. Join Megan in this applique technique class to learn different ways to achieve effective hand applique results focussing on both technique and design. Topics covered include template preparation, fabric choice, fussy cutting, needle turn applique, turned edge applique, finishing options, including hand quilting. Beginners to experienced quilters wanting new inspiration are welcome in this class.